You may be interested in visual merchandising based on its day-to-day responsibilities, but you might also be wondering what your earning potential will be right after you graduate as well as over the course of your career. Questions such as What is the average visual merchandising salary? and How much does a visual merchandiser make? are answered below. Visual merchandisers and visual merchandising managers makes an average of $35,553 per year, based on salaries pulled from three separate third party websites. When considering salary averages, keep in mind that your specific earning potential will depend on a range of factors. Years of experience, education, job title, location, and company specifics will all play into your earning power. By examining salary data, you will be better prepared when planning your career path and negotiating salary with employers. Be sure to return to this page, since it will be updated regularly with applicable salary data. Four salary websites - Glassdoor, PayScale.com, Indeed.com, and Salary.com - put the average salary of a visual merchandiser somewhere in the $30,000 range. This is average for a visual merchandiser, although a degree in this field will also prepare for other jobs relating to fashion marketing and merchandising management. Below is salary information for other professions related to visual merchandising. We have pulled the low and high end of salaries for visual merchandisers and visual merchandising managers from several sources. The low end of this range should not be taken as a definitive indication of what your starting salary will be. Education, internship performance, and other types of hands-on experience may translate into higher wages when you enter the job market. The geographical area you’re in will affect how much you can expect to earn in the retail fashion industry, and nowhere is this more true than in New York City. 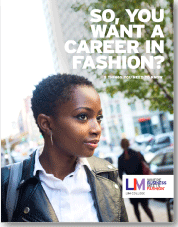 As the nation’s fashion center, New York City attracts top fashion talent and enthusiastic visual merchandising job applicants every year. For these reasons and others, NYC salaries tend to be higher than the national average. Here’s a comparison of NYC vs. national average salaries, according to third-party websites. Now that you’ve seen some of the national averages and third-party stats, we also have some salary information from recent LIM graduates. We surveyed our 2017 graduates on their employment rates, job titles, and salaries. Interested in pursuing visual merchandising? LIM College offers a specialized visual studies program. In LIM College's Bachelor of Business Administration (BBA) in Visual Studies degree program, you will develop creative and technological skills, while also taking core business courses. Whether in a computer lab, photography studio, or in an actual professional workplace, your learning will be focused on skills and knowledge that can be applied in a variety of creative careers across a broad range of industries, including traditional retail visual merchandising, exhibition design/installation, and set design/photo styling.